The Georgia Boot® Homeland Steel Toe Waterproof Wellington is part of the Homeland Collection. This pull-on boot offers you safety on the job as it is ASTM certified for its steel toe and electrical hazard protection. Full-grain waterproof leather with 900-denier CORDURA® fabric keeps you dry in rainy and muddy conditions. As with all footwear in the Georgia Boot® Homeland collection, this boot has a direct-attached oil-resistant PVC outsole for flexibility and comfort. The Homeland's polyurethane TDC insole never breaks down and has channels to promote air circulation, helping keep your feet cool all day. Features PROTECTIVE TOE: Impact testing determines the amount of protection to the toe under various foot pounds of force. Compression testing determines the amount of static pressure a steel/composite toe cap can withstand. Our boots are I75/C75 ELECTRICAL HAZARD: Footwear is built with nail-free construction using protective toe caps to help insulate you from the ground retard conduction, but is not intended to be primary protection against electric shock. Leather footwear must be dry. Our electrical hazard boots meets and exceeds ASTM F2413-05 electrical hazard standards. WATERPROOF: This product is built with quality waterproofing materials to keep you dry in wet environments. GEORGIA® WATERPROOF: Don't sweat it. Air gets in, even though water can't. Water can try to flow past this obstacle, but there's a 100% guarantee it won't. The Georgia Waterproof system comes equipped with a heavily fortified defense against water, because dry feet are happy feet. Specifics 900 denier CORDURA® Full-grain waterproof leather Steel shank ASTM F2413 protective toe classification ASTM F2413 electrical hazard standard Direct attached oil-resistant PVC outsole TDC (Technology Driven Comfort) polyurethane insole 11 Inches in height. However, we provide expedited services as well. If you don't see a particular service you need, or you need something faster than what we advertise, just let us know and we'll do everything we can to make it happen. We warrantee and represent that the goods are as described in the above listing. We specifically disclaim any implied warranties of title, merchantability, fitness for a particular purpose and non-infringement. At ToughKicks we stand behind our products. Each brand we carry is carefully selected based on their reputation for making long-lasting, comfortable footwear that wont let you down, and neither will we. We strive to build long-standing relationships by providing outstanding customer service, creating loyal customers that form the foundation of our business. Simply reach out to us and well see what options we have to make it right for you. To ensure expedient service, please be sure to return your product in the same manner in which you received it, including all original tags and/or paperwork. ToughKicks reserves the right to refuse any non-defective return that shows signs of any wear or alteration from its original condition. Every product you see in our store is 100% authentic. If you don't see what you need, just send us a message. There are thousands of styles to choose from and one of our footwear experts will be happy to help point you in the right direction. You may also be interested in.. 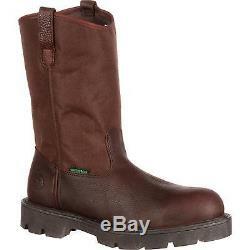 The item "Georgia G111 Homeland 11 Steel Toe Waterproof Pull On Wellington Work Boots" is in sale since Tuesday, January 24, 2017. This item is in the category "Clothing, Shoes & Accessories\Men's Shoes\Boots". The seller is "toughkicks" and is located in Logan, Ohio. This item can be shipped to United States, Canada, United Kingdom, China, Mexico, Germany, Japan, Brazil, France, Australia, Denmark, Romania, Slovakia, Bulgaria, Czech republic, Finland, Hungary, Latvia, Lithuania, Malta, Estonia, Greece, Portugal, Cyprus, Slovenia, Sweden, South Korea, Indonesia, Taiwan, South africa, Thailand, Belgium, Hong Kong, Ireland, Netherlands, Poland, Spain, Italy, Austria, Bahamas, Israel, New Zealand, Philippines, Singapore, Switzerland, Norway, Saudi arabia, Ukraine, United arab emirates, Qatar, Kuwait, Bahrain, Croatia, Malaysia, Chile, Colombia, Costa rica, Dominican republic, Panama, Trinidad and tobago, Guatemala, El salvador, Honduras, Jamaica, Antigua and barbuda, Aruba, Belize, Dominica, Grenada, Saint kitts and nevis, Saint lucia, Montserrat, Turks and caicos islands, Barbados, Bangladesh, Bermuda, Brunei darussalam, Bolivia, Ecuador, Egypt, French guiana, Guernsey, Gibraltar, Guadeloupe, Iceland, Jersey, Jordan, Cambodia, Cayman islands, Liechtenstein, Sri lanka, Luxembourg, Monaco, Macao, Martinique, Maldives, Nicaragua, Oman, Peru, Pakistan, Paraguay, Reunion, Viet nam.